Key West fishing charters consider the dolphin fishing in Key West as one of the best experiences on the water. The Dolphin is often considered the most desirable fish to catch for eating. The Dolphin, Mahi-Mahi, Dorado are all names for this beautiful pelagic fish. Dolphin are one of the fastest growing fish in the ocean, growing from 1 to 10 lbs in its first year of life. The fast growth rate of Dolphin make them plentiful in the ocean. Bright blue and green are the colors of these beautiful fish. They are known for being able to change colors at will for camouflage purposes. It is a delectable fish for table fare, on the grill it is the favorite of most. 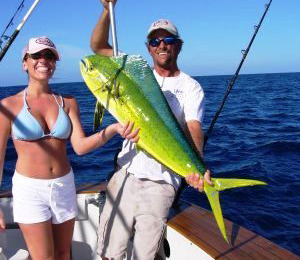 The Dolphin or Mahi-Mahi can be caught all year around in Key West, Florida. Due to the warm gulf stream waters which pass very close to the tip of our island, the fish thrive in this temperate zone. May through September is the peak of the season with most of the monster bull dolphin are caught in May and early June. Fishing Key West for dolphin is always fun and the family will be sure to love the steaks on the grill at the end of the day. In order to get the most out of Dolphin Fishing in Key West you better know where to go. Dolphin can be caught anywhere from 10 to 5000 ft of water. 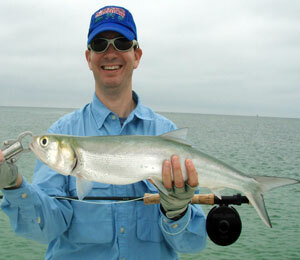 Most fish are caught between 150 and 1000 ft of water depending on the location of the Gulf Steam. Most fish congregate under debris such as: Sargassum weed lines, boards, rope, buckets and any floating structure. 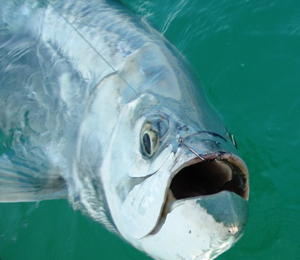 Trolling rigged ballyhoo and plastic lures are the favorite methods of most Key West fishing charters. Trolling at a speed of 3 to 6 mph seems to create the effect of a live swimming fish with tremendous effectiveness. The Dolphin Demon lure is an excellent choice and rigged ballyhoo can be purchased at most tackle shops in your area. The open faced smaller conventional reels are a great choice for trolling. The shimano Trinidad 30, lined with 30 lb test works well. We tie a bimini twist knot to a 50 to 80 lb leader to the hook. 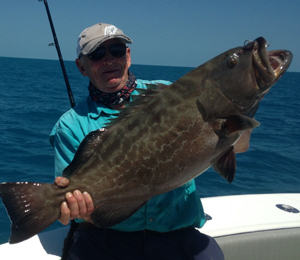 A 5 to 10 ft leader of 60 lb test is used mostly by charter Captains dolpihn fishing in Key West. Any 20lb spin outfit works well for the smaller school sized fish which will follow the hooked fish to the boat, so be ready. A 7 to 9/o hook works well with the ballyhoo while trolling. A 4/o or 5/o hook with be fine for the school fish which range from 2 to 10 lbs.